WEST OF HELL Releases Brand New "Fly On The Wall" Vlog Today; More Vlogs Coming Every Thursday! On Tour This Summer in Canada! Vancouver, BC’s WEST OF HELL, featuring vocalist Chris Valagao of ZIMMERS HOLE on vocals, have released a new video blog in their new vlog series, dubbed “Fly On The Wall”. The guys find a BB Gun and have some good backwoods fun. You can watch the video and stay tuned for more videos coming every Thursday throughout the band’s upcoming tour, kicking off tonight. Last week, WEST OF HELL released their new music video for the track "Water of Sorcery", which is viewable now HERE. The cut is from the band’s debut album, Spiral Empire, which was produced by Rob Shallcross (3 INCHES OF BLOOD, STRAPPING YOUNG LAD) and hit stores in May 2012 via Reversed Records. Spiral Empire is available for purchase now at iTunes, Amazon, and other digital retailers as well as in the KNAC.COM More Store HERE. 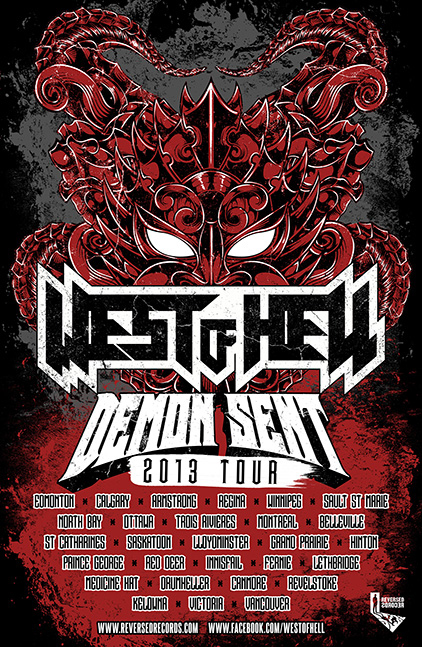 WEST OF HELL will head out on a headline tour of Canadian cities beginning July 18, 2013. This tour comes after a very successful tour of New Zealand with SINATE. WEST OF HELL plans to release a vlog series throughout the tour, dubbed “Fly On The Wall”. This week's vlog is titled "Look What I Found!". Be sure to check back every Thursday for a new vlog! See below for all upcoming tour dates!